Dubai, 27 March 2018: An Alliance for Youth bringing together companies and other entities interested in helping young people in the region enhance their skills and develop their careers is launching in Saudi Arabia, contributing to the regional commitment to impact 50,000 and employ 3,000 local youth by 2020. 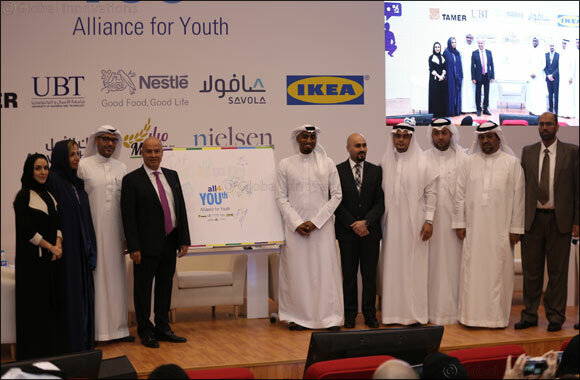 The Alliance in Saudi Arabia, coming two years after the regional launch based on a model created by Nestl� Middle East; is starting off with partnership between Alawwal Bank, Ikea, Mayar (Muhaidib Foods), Nielsen, Savola, Tamer Group, and the University of Business and Technology. “We know from experience in other countries that concerted collective efforts through partnerships and collaboration amplify positive impact in society,” said Samer Chedid, General Manager at Nestl� Saudi Arabia, which employs 490 people in the Kingdom, over 35% of whom are Saudi Arabian nationals. These include 181 youth under 30 years old, and 79 Saudi women. Announced at a Youth Conference held at the University of Business and Technology in Jeddah and attended by over 100 young talents, the Alliance kicked off with a pledge from participating companies to engage in collective activities, develop individual initiatives towards youth, and to consolidate collaboration between them. The Alliance in Saudi Arabia also comes six years after the Nestl� Center of Excellence's launch in 2012, so far training more than 200 young Saudi men and women in the country through courses for a Nutrition Development Program, a Business Executive Certificate for Women, and a Sales Training Academy. The Center's mission is to help bridge the skills gap between academic curriculum and corporate expectations. “This Alliance is set to further expedite efforts to prepare local youth for employment in multinational, regional, and local companies, and provide more of them with careers across the country,” added Chedid. Nestl�'s efforts fall in line with the company's Creating Shared Value commitment to “Foster Opportunities for Youth,” published in its first Nestl� in Society report for the Middle East in 2015. The Alliance for Youth now consists of 17 members across the Middle East, with a collective goal to impact 50,000 through internships, graduate and training programs, and apprenticeships opportunities, and hire 3,000 by 2020.